For those recently arrived, I do a meter reading every night, but summarise the annual figures every Sunday. As we seem to get oscillating years (2010 cold, 2011 v warm, 2012 v rainy) I am also compiling an average over 2 years to smooth out these bumps. were uniformly grey and rainy, well down on 2011 figures. Summarising July 2012: Another bad month weather wise with the PV 100 kWh down on the previous year, (June was worse, 150 kWh less than in 2011) so all my figures look unhappy. Correspondingly, Sunbox capture is also down on 2011's figures. However. It has not been cold enough to require Heating, so for June and July, the GSHP is only concerned with Hot water, and those figures are holding level. 29 July 2012: There is a gap because Ive been on holiday and not able to collect data. During the week, the GSHP was turned off, and it was a sunny week, so a decent amount of heat was buried, although the Tubes failed to work.... they overheated and got an airlock, it seems. The problem was on the ground loop side, not the tube-side. 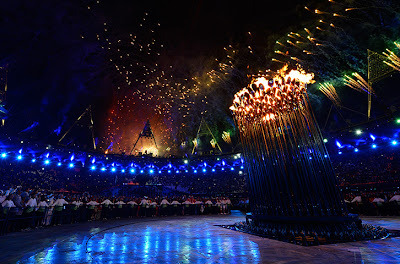 In other parts of the world, it was the week of the Olympics build up, culminating in the excellent opening ceremony, choreographed by Danny Boyle, with this cauldron sculpture by Thomas Heatherwick. The House meter is still hovering just over 5,000 and the GSHP just below 3,000, and a few days on holiday makes little difference (as we tend to leave the fridge and some lights on, and one year ago, it was so hot that little power was being used). PV is slowly improving at 3,095, and the buried solar heat is 2,566. For those recently arrived, you may have noticed that I regularly mention 3,000 as the figure for buried energy. We had a two month period this spring of the system not working, plus months of rain+cloud, so the figure is crawling slowly upwards from a low of 2,500 kWh. Ground temperature is well above 13º, being 13.6º on Saturday and 13.8º on Sunday evening. 15 July 2012: Another rainy week, with more predicted for the coming week. Annual figures are level, as we continue to wait for some sunshine. Never mind, it's better than living in Kansas - the drought in the US is worse than it was in the dustbowl depression of the 30s. House 5,007 kWh (improving), GSHP 2,983 kWh (level), PV 3,033 kWh (worrying), Sunbox, 2,529 kWh (lower), all annual . The House meter used to keep pace (always 2,000 more than the GSHP), but it is running away a bit because the PV has performed so poorly in the weeks of rainy weather. The GSHP meter is holding level because there is still a reasonable amount of recharging taking place. Until the weather improves, it won't get better. 2011 was such a fantastically mild year, it's impossible to beat! Ground Temp 13.1ºC... quite good considering the gloomy weather. With this dull weather, the Sunbox has not been so productive either. 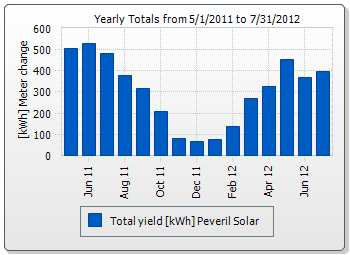 From 23 April to 15 July it produced 686 kWh, and in the same period last year 886 kWh and 883 kWh the year before. However.... based on my thermal modelling, the energy level below ground is at least up to what it would be after an entire summer of natural recharging - so any more that goes down in August is a bonus. 8 July 2012: July continues as wet as June, so far with more floods in the UK. I would hate to be an Olympic organiser now, it must be very worrying for the outdoor events. Here's an interesting page on the BBC website by David Shukman explaining how the static Jetstream position is bringing us this bad weather. This is what it must be like in the Orkneys all the time, except that it gets even colder and windier up there. Despite the bad weather, the Peveril Solar house is performing reasonably well. Until the weather improves, it won't get better. My sister in law's house flooded yesterday, so other people have far more troubles to worry about, compared with my meters. Ground Temp 13.2º, because the heat pump has little work to do, and there is still warmth in the air, despite the quantity of rain. I am very content for it to be above 13.0º ! What else happened in the world? Well Tom Cruise and Katy Homes broke up, the rich banker Bob Diamond decided to resign after his bank's wrong-doing, pocketing 2 millions pounds as a pay off from the bank. Wouldn't it be great if all crooks and swindlers could get payoffs just before they go to jail. Biggest news for world science is that the Higgs Boson was announced on Monday, as something very very small and heavy that had been discovered (having been predicted 40 years ago. The British TV comedian Eric Sykes died at 89 and the US Oceanic Survey declared that after years of compiling records and reports, they could declare that there are no such things as Mermaids. The Wimbledon finals completed, with Serena Williams winning the women's. Roger Federer beat Andy Murray after a very good (rain interrupted) final, and Murray had done brilliantly to beat Ferrer and Tsonga in previous rounds. Wimbledon becomes a sort of addiction, I am sure that some British wish it could go on for ever like the Archers. 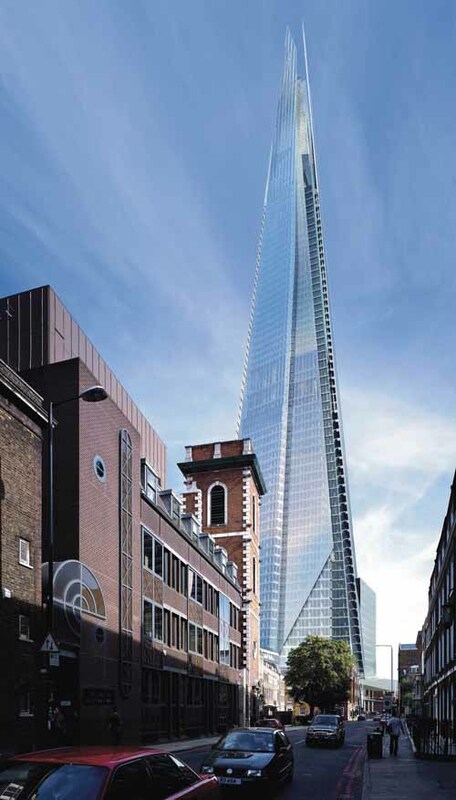 Finally for this week, we saw the London Bridge Shard tower completed and opened - the highest skyscraper in Europe until the Moscow tower is completed. 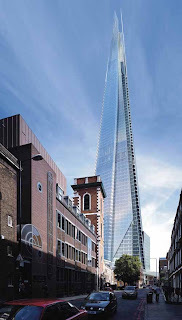 I am hoping to get a private viewing of the interior in September, watch this space! 1 July 2012: Good riddance to June, but July doesn't look likely to be any better. A week ago, the Daily Express claimed that we have a sizzling summer of sunshine ahead of us, but the agency they use just provides filling for the front page when others are reporting real news, and are always wrong. The reality is that we've had another week of rain and grey and have one coming up in the next forecast. This was front page on a day when all the other papers reported on Cameron's proposed attacks on the young, cutting housing and other benefits even more for the under-25s. Don't vote for the millionaire Etonian next time, folks! A week later, the same newspaper predicts more months of rain. The biggest news of the week in the UK has been the collapse of the RBS computer system at the same time that Barclays admitted and were fined for serious corruption in tinkering with the LIBOR rate. Only 2 years ago, RBS laid off 3,000 IT staff in the UK, and employed a few hundred offshore, even though they had been saved by the British taxpayer - is it any wonder that when there are major computer glitches, they haven't got the staff to sort it out? So far, Tory govt seems to resist calls for an enquiry or prosecutions, despite the eagerness to put teenagers into prison a year ago for nicking trainers or bottles of water during the riots. At Wimbledon, Nadal was knocked out early, and Murray has survived to the second week. 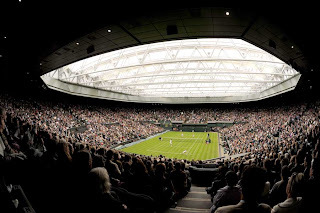 The tennis has only been possible thanks to the covered centre court, and the programme going on to 11pm! In the Ukraine, Spain won the final of the Euro football with a cracking 4-0 victory over Italy! England had serious floods in many places in the first part of the week, while in the US, they have had yet more unprecedented levels of heat wave (and the fires that result), followed by major snap thunderstorms and wind speeds on the east coast, coming out from the interior. Pity that the majority of them believe that it's God doing it to them, not putting the blame on decades of carbon build up in the atmosphere, made worse by the heat wave air-conditioning and forest fires. The Olympic flame passed through Nottingham and West Bridgford, and I went into town to see Torvill and Dean in the last stage of the day. For Peveril, the annual figures are just about holding position at the moment, not improving. 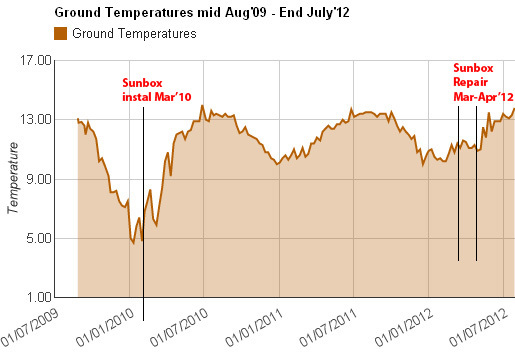 June this year has had less solar radiation than April or August of 2011. Sunbox, 2,580 kWh annual (with the omission of most of April 2012). Until the weather continues, it won't get better. It is almost cold enough in July to need some heating in the evenings! Ground Temp 13.4º, a good figure considering the sunless weather for the recent month. That means it is at optimal temperature already for the summer, with months of warm weather yet to come. Further deposition of energy usually widens the energy bulb rather than making the borehole warmer.